The Apple Watch began shipping this week, and arriving in some stores Friday -- just not its own. As of nearly noon Pacific Time, Jeremy Duimstra, cofounder and executive creative director at San Diego agency MJD, patiently waited for his. "We're expecting at least one today, a total of four within the next week," he said. Voice search features in Siri and those built into apps for Apple Watch provide marketers with new opportunities. Duimstra said Siri's powerful voice search capabilities at launch provide an interesting opportunity for brands to provide location Map information on a map, for example. "If I'm a big brand and I want someone to know where to buy my item, they can ask Siri to find it for me," he said. Indeed, the San Diego creative agency has been working on apps for companies like Viper, Yelp, Nest and Philips. The Viper connected app will allow individuals to start their car, lock or unlock the doors, and open the trunk. Trip Chowdhry, managing director at Global Equities Research, estimates that Apple approved about 4,000 Watch apps to date. He sees that developers continue to switch from Android to Apple iOS. Apple has limited the features that developers can build into the app, Duimstra said, at least for this iteration. Some of the features on the phone are not yet available on the Watch. He points to Siri as one feature that is showing improvements. The future of advertising on Apple Watch and other wearable devices looks more like contextual advertising, Duimstra said. "The ads will look like where-am-I-physically in the world features — what's around me — and people buying into networks that allow restaurants and other physical locations to show up on the device," he said. Duimstra said the industry could see the emergence of networks that create an ecosystem around physical locations. These do not exist yet. "I can't go to Google and say: 'Hey, I want a contextual geo-located opportunity to show on an Apple Watch,'" he said. "There's a new opportunity for advertisers. 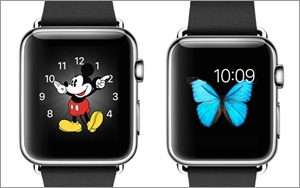 You would have to build the functionality into the apps that could talk to the Watch. It just doesn't happen, yet."